Another busy period has passed and I have once again found myself tramping around many different river banks ranging from the Mohaka, Waipunga, Tauranga Taupo and the mighty Tongariro. I must admit though that the Mohaka has come up trumps this week with some amazing fish to the net. The past couple months has proved very difficult to access the Mohaka due to a huge flood which put an end to any form of fly fishing for a long time this raising concern on how the fish have got on and if they pulled through ok. In my opinion the fish are fine and in fantastic condition and can only believe that the fish are bigger and stronger for itÂ which will set them up perfectly for a successful spawning season. I have just spent three days on this amazing river with Joe Tweg and have experienced hard fighting great quality rainbows on every day from almost every pool. Most fish are ranging between 3 and 4lb but you should expect at least one 5lb fish to turn up in a day outing. Pound for pound these backcountry beasts must be the strongest trout around as they will not give in until the point that they struggle to be released due to exhaustion. I have had most fish on the nymph rig with the odd fish being fooled on very small drys such as para adams or caddis imitations. When selecting nymphs for this river you will always do well with the favourites like the hare and copper or PT nymph in a size #14 or #16. Loading up with weightÂ is not necessary in most pools as this fish are always on the look out for food and will pick up nymphs from all depths of the pools just be sure to concentrate on achieving a effective drift. Rafting on the Tongariro was again a hit with lots of great condition fish in the 3lb mark on both small drys and the standard nymph rig. Most fish are being taken in the lower half of the raft trip now and we are waiting for the spawners to once again fill those upper pools. This is a trip which is always worth doing regardless of the time of year and is very professionally run in conjunction with Luke and PianicaÂ from Rafting New ZealandÂ in Turangi. The Tongariro has not produced any monsters this week for my clients but believe me there are plenty in there to be had and it’s only a matter of putting yourself in there to achieve a dream fish. I fished with Kim and Tim from Tasmania for a half day which was an absolute pleasure as this guy could fish and cast like a machine. Tim used to be a saltwater casting instructor and had no problems throwing the LOOP 7weight and wrestling 3lb rainbows from our clear waters. Kim was trying new things with the new camera and got some great footage which she managed to turn into a YOU tube video which can be viewed on the homepage of this website by clicking on PLAY. This is a first for “Christmas on the River” but now I have seen how easy it is to do it will not be the last so full marks to Kim for sharing the action with everyone else!. The river seems to be full of a small fish at the moment which are on their way back to the lake to get fat and mature before returning to the river to spawn. Unfortunately these fish are easily caught so try and be careful when setting them free as they are our future fish that we rely on to entertain us in the future. There are still some very fat shags hanging about on most old trees which are obviously eating their weight in fish every day!! Why we can’t get rid of these useless sea birds I don’t know? Rain is still needed in most of our Taupo rivers and I think most of us are waiting for the first flood to clear the weed out and send a few fresh up to kick start the season which in my opinion should be a blinder. Although fishing under a full moon at the moment those who have been going out have done very well with solid brown trout and stocky rainbows. 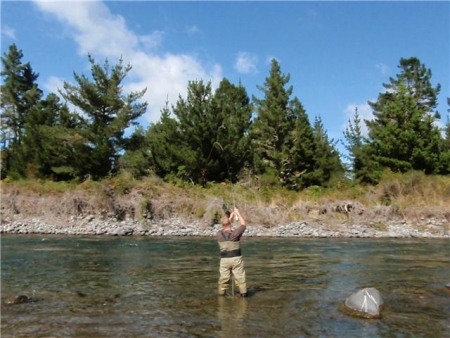 The Waitahanuie seems to have some great fish both in the rip and up the river as does the lower reaches of the Tongariro. I have personally only been down once this week and I got SKUNKED but that’s not unusual for me in this river or part of the world. I got my camera back today finally so will be updating more often with some new photos, so that should keep reading a little more interesting for you loyal readers. Your readership is truly valued and drives me at the end of a day to report on where I have been so keep logging in.